myVALE is an individually manufactured and complex product. 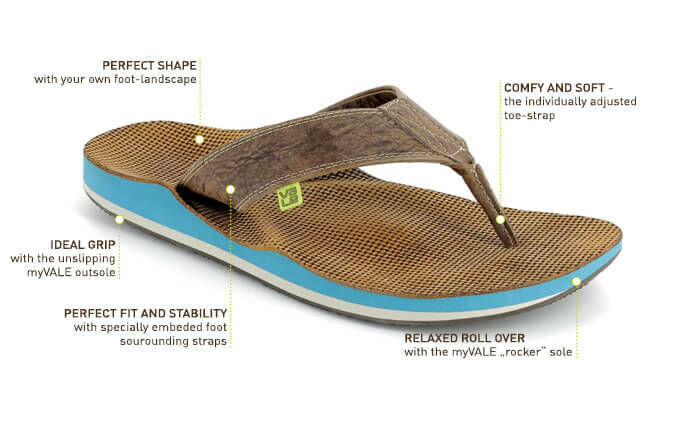 For this reason, myVALE sandals currently take approximately 21 days to make after the footprint box has been returned to us. Here you can find out why and what the process involves. Start by taking your time to choose and order your favourite model online. 2. The myVALE footprint box is sent to you by post. Once you have ordered your model, the myVALE footprint box is sent to you by post. 3. Leave your footprints in the footprint box for us. You can now leave your footprints in the footprint box as well as marking the point for the thong. Precise instructions are included with the box and are also printed on the side off the box. When you have left your footprints in the footprint box, pack everything up again and send the box back to us. Simply hand it in at a post office. No additional postage cost is incurred. We digitise your footprint from the footprint box using a 3D scanner. Our myVALE orthopaedic experts then model and process the scan. Your footbed is then cut out of the materials you selected by means of a computer-assisted milling machine. All the myVALE components are now assembled by hand in over 25 production stages. As soon as your personal pair of sandals is finished and has been subjected to a quality inspection, we send them to you by post.